This voucher is valid for one child 14 years of age and under or a pensioner/senior citizen producing an official identification card at the cinema box office for a ticket to the session of your choice or redeemed online (Village Cinemas only). The voucher cannot be used for any movie session from 5.00pm onwards on Saturdays. Vouchers do not guarantee or reserve a seat – seating is subject to availability. Vouchers are not valid for Gold Class, group books, movie marathons, special events or in conjunction with any other promotion unless otherwise stated. A surcharge applies for VMAX and 3D/Real D films. It is the responsibility of the holder to use this voucher before the displayed expiry date. Expired vouchers will not be extended or replaced. Vouchers are not refundable and cannot be exchanged for cash. 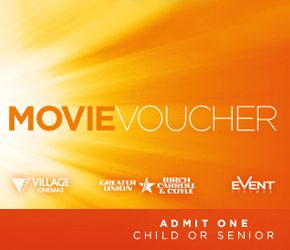 Vouchers cannot be sold or advertised without the prior written consent of Village Cinemas Australia.